March 9, 2015, might be one of the more remarkable dates in Cheltenham Festival history, as Willie Mullins turned the sport's most fiercely competitive arena into his own personal field of dreams. As first Douvan and then Un De Sceaux returned to the winner's enclosure, the silks and attendant scarves may have changed from pink to sky blue and orange but the central brains trust remained the same. There was the gracious tip of the Mullins trilby and the beaming smile of wife Jackie, as well as loyal lieutenant and talent scout Harold Kirk. And there too was the man who had scoured the French countryside to unearth these irresistible talents. "The first day of Cheltenham last year was unreal," says Pierre Boulard, sipping on a fruit juice in one of French racing's most famous breakfast joints, La Chasse a Courre in Chantilly. "I sometimes think, ‘how are we going to do that again?' Winning four Grade 1s and having the first three in the Champion Hurdle was perfect." Boulard also bought the middle part of that Champion Hurdle tricast in Arctic Fire, and would be back in the number-one spot later in the week thanks to Don Poli and Vautour. He adds: "Willie is a genius and the competition is so high there. There are a lot of very good trainers in England and although it looks easy, it's not." French horses have become a huge part of the Mullins armoury so it is easy to forget his first festival winning imports, Mikael D'Haguenet and Quevega, were only in 2009. "I knew Quevega was for sale and it was quite special because I bought her as a two-year-old at the AQPS show in Cercy for her owner Monsieur Biraben. She won three bumpers at three. I was told she was for sale and I mentioned it to Willie, who was very interested because he'd had her brother Monvega in Ireland and thought he was a very good horse but he had training problems. So we made a deal and that's how it started." And Mullins uses only Boulard in France, who in turn has a client list of precisely one trainer. "When I started buying horses I was also agent to Stephane Pasquier, he says. "I didn't want to get any other jockey - which probably wasn't great for business - and I concentrated on him and we did very well for four years up until he won the Arc with Rail Link. I find it a problem to work for different people. I couldn't put Willie in competition with other trainers." 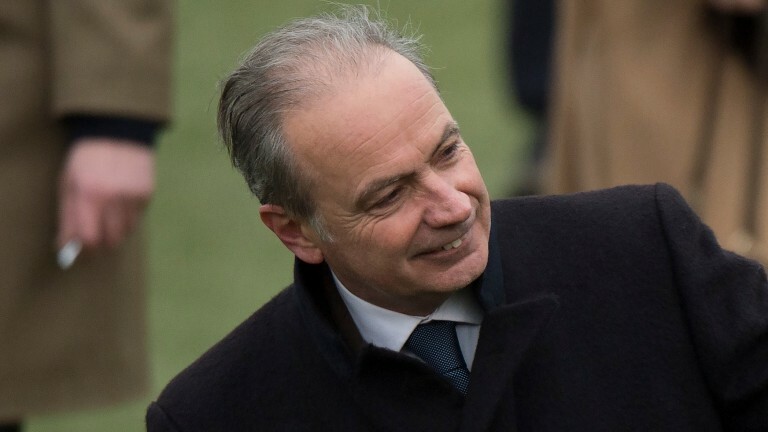 Such a policy must have been a big risk in the beginning, especially as Boulard had previously enjoyed success with a number of clients including France's greatest jumps trainer Guillaume Macaire. Yet when Mullins came knocking in the middle of the last decade, he was rekindling a personal and familial relationship from 20 years earlier. He explains: "I was working in Maisons-Laffitte at the yard of Jacques-Hubert Barbe - the father of agent Hubert Barbe - and Dawn Run came over with her trainer Paddy Mullins. Nobody else spoke English so I helped him. He said if I wanted to come and gain experience in Ireland to go to him. "I went the next year, the year Dawn Run won the Gold Cup. Willie was there, in fact all four brothers were working for their father." The great mare won the Grand Course de Haies in 1984, only to be killed in the same race two years later. Boulard credits Paddy Mullins' spirit of adventure as the spark that has made his son a regular visitor to the Paris track as well as chasing glory as far afield as Japan and Australia. And he recalls a prophetic conversation from his time in Kilkenny that may explain the pipeline of success flowing between Chantilly and Closutton. "I remember I was in the car with Paddy, going to the races. He said he could see that one day French-bred horses would be very good over the jumps. I wasn't sure but he was right." What is surprising when you examine the records in France of many of Boulard's most successful acquisitions is how few wins there are next to some of the names. "We don't want a store because we don't know about the quality. But we don't want one who is too exposed. They just need to have shown me something special. "When Djakadam ran at Compiegne I went ‘wow'! He could have won if the jockey hadn't been so easy on him." As Boulard warms to his theme the names begin to tumble out of him. "Douvan won second time in a very good way," he says. "Un De Sceaux won twice on the Flat in a nice, easy way. Vautour had two runs and did something even though he wasn't fully fit, Vroum Vroum Mag the same." Perhaps the most compelling example among the festival first-timers will be the horse who bids to fire the starting flare in the Sky Bet Supreme Novices' Hurdle, following on from Champagne Fever, Vautour and Douvan. Min's two runs at Auteuil for Yannick Fouin yielded a third and a fourth, neither effort screaming future star. "Min is a son of Walk In The Park and we had so much success with Douvan, says Boulard. "Harold really believed in Walk In The Park when we bought Douvan and said go for it. I liked Min physically and the performances were good enough because Auteuil is the biggest test of stamina in France. It was important I liked him physically and then I add in the pedigree and his race. It was the three together." Rumours of flying work at home ensured Min had been favourite for the Supreme since last August, long before he made his debut for Mullins. Surely there must be less expectation with Min than there will be 72 hours later, when the Boulard finds Vautour, Djakadam and Don Poli present Mullins with his best chance of a first win in the Timico Gold Cup? "Because I'm not English I maybe don't realise the importance of the Gold Cup," says Boulard. "Of course I know it's the race, but for me the other Grade 1s are very important. It was great with Vautour [two years ago] and then there was a lot of pressure with Douvan because he was the ante-post favourite. I don't see the difference between those Grade 1s and the Gold Cup. On Tuesday, when Min has been favourite for a long time, I'll be more anxious." If the bookies have it right then Boulard will have already followed in a hatful of winners by the time the Gold Cup is run. Perhaps then he will let the excitement win out over the anticipation, but you half suspect he will already be thinking about how to maintain the ‘new normal' chez Mullins for 2017 and beyond.